Court of Appeal yesterday declined to grant formal leave to appeal to the Supreme Court contesting its judgment of the conviction and the sentence of Gnanasara Thero on 8 August. The Bench comprised Justices P. Padman Surasena and Shiran Gooneratne, who were of the view that there is no substantive question of law to grant leave. When the matter was taken up, Counsel Arseculeratne PC, appearing for the Accused-Respondent Gnanasara Thero, submitted that the charge against his client emulates from a single incident and that there is no admission of specific act. He submitted a question arises as to whether each act could be taken as separate act. He cited three grounds for leave to appeal is to be sought in the Supreme Court. One: As a matter of law, the accused can be charged, convicted and sentenced separately for four separate counts in respect of one incident that occurred before the Homagama Magistrate’s Court on 25 January 2016. He submitted that when there is one Contempt Of Court charge, it had been split into four charges. Two: An overall sentence of six years imprisonment excessive for a single incident of Contempt Of Court of the Magistrate’s Court whereas a sentence of two years imprisonment had been imposed by the Supreme Court against S. B. Dissanayake in respect of Contempt of the entire Supreme Court. Three: Should the mitigatory fact that the Accused-Respondent did not appear before Court for his own personal cause but instead due to his own patriotic sentiments for the cause of the soldiers who fought to end the war be considered by the Court in sentencing the Accused-Respondent? He submitted that the Accused-Respondent did not interfere for his own cause but for the common cause and that he addressed the Court in a way that may be improper. Deputy Solicitor General Rohantha Abeysuriya, appearing for the Attorney General, submitted that the test which is to be used should be objective. He argued that the question of mitigation of sentence did not arise as there is no mitigatory situation where it is not sudden provocation. He submitted that the Accused-Respondent in his speech addressed aspersion with his intention and that it is Contempt Of Court. He also underlined that the Court must be free from external interferences and it should not be allowed to interfere with the Court proceedings. He submitted the Court should not take into account the mitigatory facts but subjective factors. He also said the Contempt Of Court matter of S. B. Dissanayake could not be equated with this matter. Court of Appeal on 8 August in its judgment found guilty of all four counts of charges on the alleged offence of Contempt Of Court against Gnanasara Thero and sentenced him for all four counts, totalling 19 years rigorous imprisonment, but ruled that these sentences run concurrently, resulting in only six years rigorous imprisonment. Homagama Magistrate Ranga Dissanayake filed a Contempt Of Court action in the Court of Appeal against Bodu Bala Sena (BBS) General Secretary Galagoda Atte Gnanasara Thero, seeking the Appeal Court’s constitutional jurisdiction against Gnasara Thero’s alleged offensive behaviour in the Homagama Magistrate’s Court amounting to Contempt Of Court on 25 January 2016. On 25 January Galagoda Atte Gnanasara Thero began to address Open Court after the Court hearing pertaining to the disappearance of journalist Prageeth Eknaligoda was over. Later on, Gnanasara Thero was arrested by police on the charges of Contempt of Court, obstructing Court proceedings and intimidating a public servant. 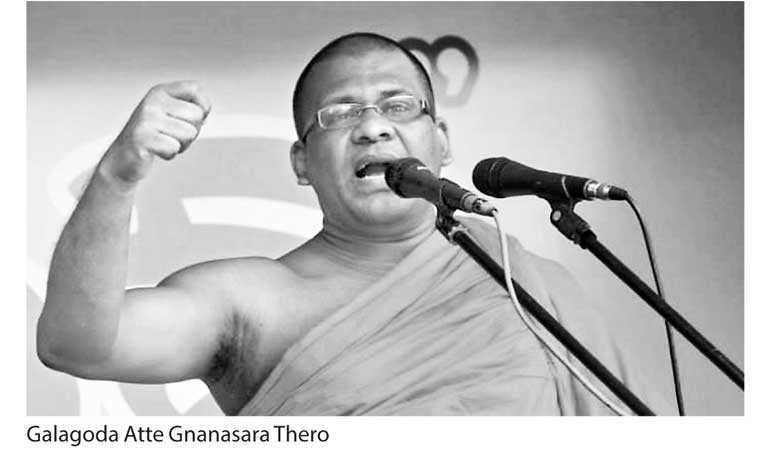 Through this Contempt Of Court action, the Homagama Magistrate sought the Appeal Court’s jurisdiction to consider whether the alleged offensive behaviour of Gnanasara Thero inside the Court amounts to Contempt Of Court. It is reliably learnt that Gnanasara Thero is to file Special Leave to Appeal directly to Supreme Court.